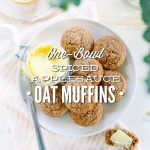 I had planned to share these One-Bowl Spiced Applesauce Oat Muffins next week, but after posting a photo of the ingredients on Instagram the other day, I received a number of requests for the recipe. I agree, spiced applesauce muffins are way too good to sit around in my draft folder, quietly waiting to be made in your kitchen. Let’s do this! 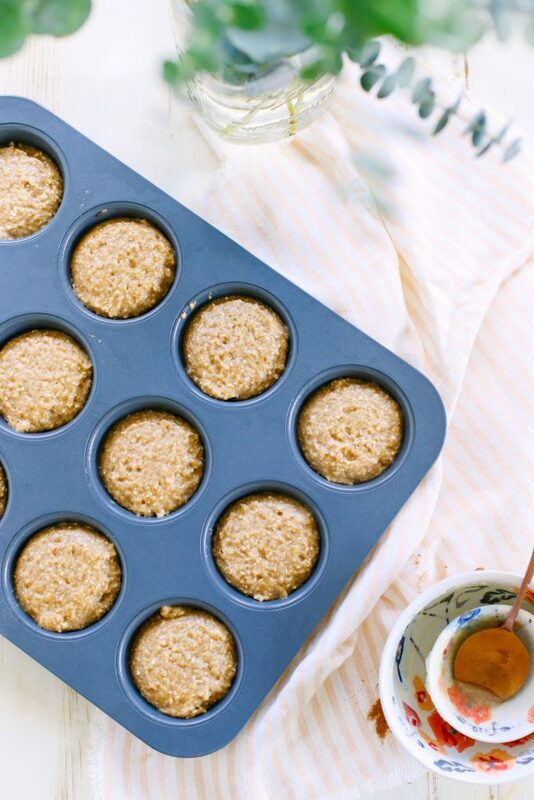 This muffin recipe was inspired by a case of 10pm laziness and my family’s dislike for oatmeal. Yes, it’s true. Today’s recipe is probably the one and only time laziness has led to instant success. Doesn’t that make this recipe an outlier, or some super sophisticated math label? A few weeks ago, on a very late Wednesday night, I stood over my farm sink washing the last of the dishes for the day. As I picked up the last plate in the sink, I began to think about what I was going to make for breakfast the next day. I turned off the water and headed over to my meal plan workbook where I found my Thursday morning selection: oatmeal. Now, I’m all for oatmeal. In fact, I could eat oatmeal just about every single morning, and bacon. Yes, oatmeal and bacon are the ideal breakfast combo for this foodie. My family on the other hand, well more like Dustin and Londyn, aren’t big oatmeal fans. I’m pretty sure their anti-oatmeal stance is the very reason why I find so many ways to turn oatmeal into mysterious and tasty creations like breakfast cookies and pancakes. Hey, oatmeal is cheap and good for the body, so I’m going to find ways to make this ingredient work for my family. As I stood over my meal plan workbook, with my wet hands dripping onto the opened page, I started to wonder what in the world I could make with oatmeal that would satisfy the whole family. I peeked inside the fridge to take note of what I could use to create an oatmeal treat for the morning. Butter? Check. Applesauce? Check. Eggs? Check. Hmmm, I thought, what about an oat and applesauce muffin? That will work! I decided it was way too late for creaming butter in the mixer, so I took the lazy route of simply melting the butter in the microwave…I know, the microwave!! The melted butter was then whisked with applesauce, honey, an egg, spices, and a few dry ingredients like oats and whole wheat flour. The result was a dozen gloriously moist and perfectly sweet muffins. To be honest, I couldn’t believe a recipe that was literally thrown together in under 30 minutes, from inception to final product, actually resulted in the most divine one-bowl muffins ever. The next morning, my family devoured every last crumb of the dozen “accident” muffins. I call that recipe success! The recipe had to be shared, so I’ve been testing and retesting it over the last few weeks. You know, I wanted to make sure the recipe was totally perfect and not just some 10pm fluke. Okay, and maybe the idea of stocking my freezer and enjoying six dozen spiced applesauce muffins was incredibly appealing. Sometimes this job is just way too hard, and tasty. Typically, I use einkorn flour in my baked goods. 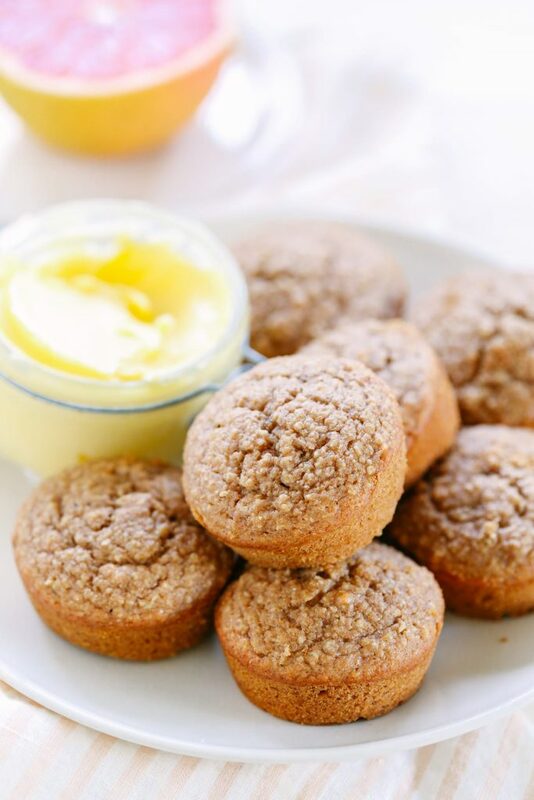 These muffins are an exception since they are made with both whole wheat flour and oat flour. Einkorn is usually my choice flour because it produces super light and fluffy baked goods without compromising nutrition. Whole wheat flour usually produces very dense baked goods, which I have a hard time enjoying. These muffins are an exception to the dense rule. The generous amount of applesauce and butter, paired with equal parts whole wheat flour and oat flour produce super moist and fluffy muffins. No one will ever guess they are made with whole wheat. The result was a dozen gloriously moist and perfectly sweet muffins. To be honest, I couldn’t believe a recipe that was literally thrown together in under 30 minutes, from inception to final product, actually resulted in the most divine one-bowl muffins ever. The next morning, my family devoured every last crumb of the dozen “accident” muffins. I call that recipe success! In a large bowl, whisk together the melted butter, applesauce, honey, egg, and spices. In a food processor*, pulse the oats for 40-60 seconds, until they are ground into a grainy, flour-like consistency. Add the oats to the liquid ingredients, along with the whole wheat flour, baking powder, baking soda, and salt. Fold the ingredients together until combined. 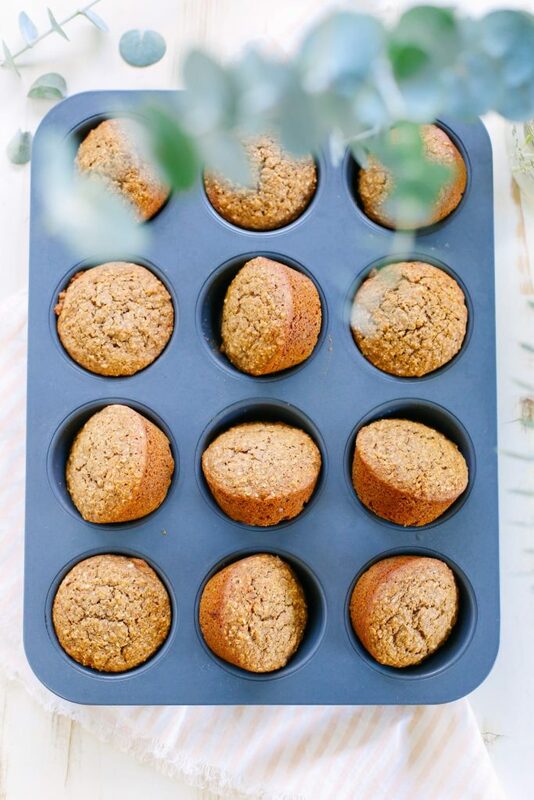 Grease a muffin pan, or line a muffin pan with muffin liners. Scoop the muffin batter into the muffin pan (I use an ice cream scooper). Bake for 20-22 minutes, until the muffins are cooked through. When the muffins are done baking, they won't feel squishy when the tops are touched, rather the tops should feel "springy" and firm. I know, that's a bit of a crazy description. Allow the muffins to cool for about 5-10 minutes before serving. Leftover muffins freeze very well for a quick and easy breakfast (learn more). Whole Wheat Flour Note: I use a scoop-and-level-off-with-a-knife method for measuring flour, so the flour is compact within the measuring cup. 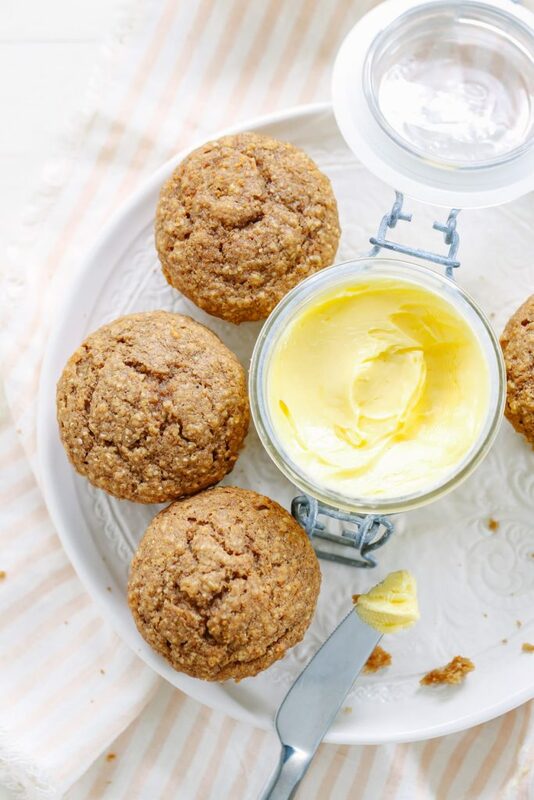 Do you think coconut oil would substitute well for the butter in this recipe? Hey Sarah, Possibly. 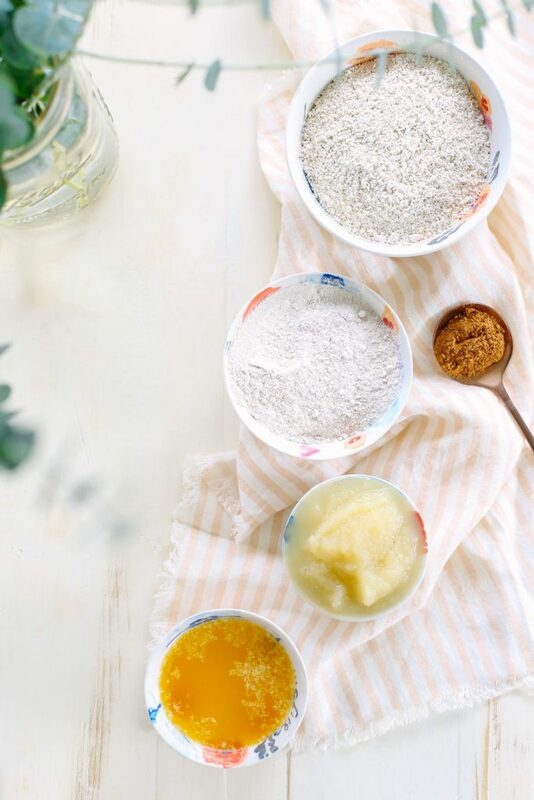 Sometimes coconut oil can produce an oily baked good, so you may want to increase the whole wheat flour by a couple of tablespoons or up to 1/4 cup. Let me know how it goes! I just made this recipe and loved it. I doubled it and used coconut oil instead of butter. Heaven! We attacked a few while warm, but then I beat the kids away with a rolling pin so I could freeze the rest for breakfasts this week. I love the simplicity of this recipe and can’t wait to make them again. Lol, that’s awesome, Jodi! I’m so glad everyone loved them. 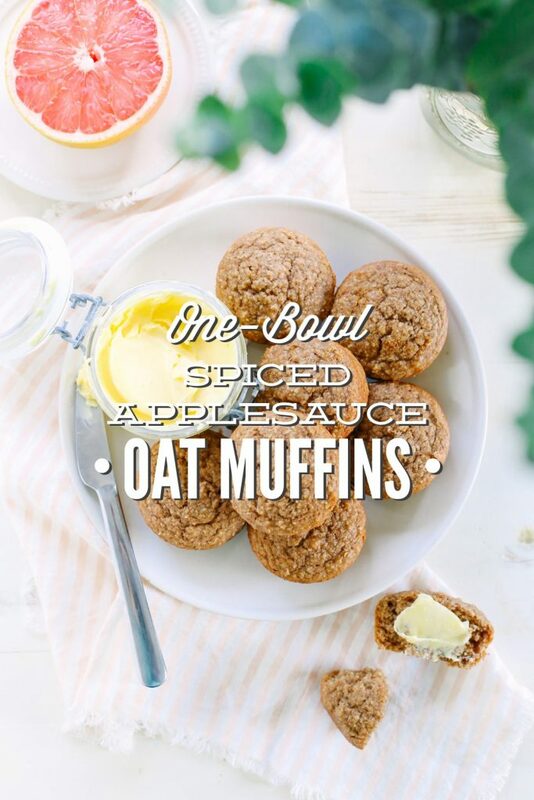 Wow prefect time as I have lots of apple sauce and love apple spice muffins. Is that homemade butter in the picture? Perfect, Melody! I hope you love the muffins :). The butter is Kerrygold. I’ve been trying to put my extra butter in a jar versus having a ton of butter packages in the fridge. Here’s a very old, but delicious Live Simply recipe for homemade butter: https://livesimply.me/2013/09/11/skim-cream-make-butter-video-tutorial/. These are awesome! Even my picky three year old gobbled them up. Thanks for another great recipe. That’s so great, Jenny! I’m so glad your three year-old loved the muffins!! Thank you so much for posting this recipe! It was rainy and dreary outside today…a perfect day for warm muffins. My family devoured these and my 1.5 yr old ate 3 whole muffins!!! That has never happened before! They were absolutely delicious! This recipe is my new favorite and we will be enjoying these on a regular basis. Thanks again! Can einkorn flour be used in this recipe? If so, would it be an equal amount or would the recipe need to be altered some? Hey Kristina, It can, but you’ll probably need more flour. Maybe up to 1 1/3 cups total flour…that’s my guess. And possibly another egg. Also, let the batter rest for a few minutes before baking. My mom found this website for me and recommended it as something I’d love. She was right. 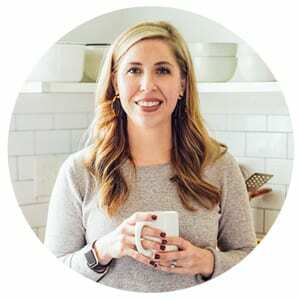 Aside from the aesthetic appeal of the website, I love your mix of reality and being positive, and how you make healthy living a simple and achievable goal. Kudos. I’m so excited I found you. Hey Sarah, I’m honored that your mom recommended Live Simply! Welcome!! Really? Pretentious much? Using the microwave is neither a horrific act nor the lazy route. Get over it, lady. Hey Sandra, I’m sorry you didn’t like my honesty. The microwave is a pretty controversial appliance these days. Most muffin recipes call for creaming softened butter in a mixer, which takes time for the butter to soften, hence my “lazy” remark. I didn’t want to wait 20-30 minutes for butter to soften. Enjoy the recipe! Hey Lauren, The oats become a flour (similar to the wheat) when ground in the food processor, so I don’t think the whole oats will work. A blender may work for grinding the oats, or you could purchase oat flour, which is basically pre-ground oats. would you need to adjust the recipe if you use oat flour? Hey Laura, I don’t believe so. 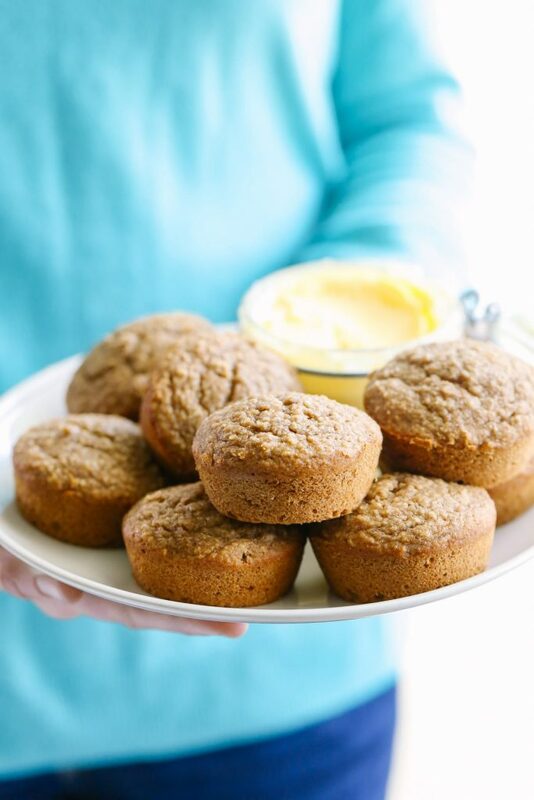 My family of six, love your Spiced Applesauce Muffins, I love all the good stuff in them! Thanks for the recipe. Enjoying your Website often. That’s so great, Cindy! I’m so glad your whole family loves the muffin recipe!! My family is dairy free, but I think my kids would LOVE these. What do you think would be the best substitute for the butter? Hey Kim, You could try coconut oil or possibly ghee? Let me know how it goes! These muffins are delicious! Great flavor and very moist! Can they be stored on the counter or should they be refrigerated? Hey Kristin, I’m so glad you love the muffins :). I store my muffins on the counter for about a day, and then move any leftovers to the fridge or freezer. I love this recipe and always find your recipes easy to follow (love those light-hearted comments too!) I used to subscribe tonnes newsletter from various foodie sites, but I find myself looking forward to only a few (yours especially!) 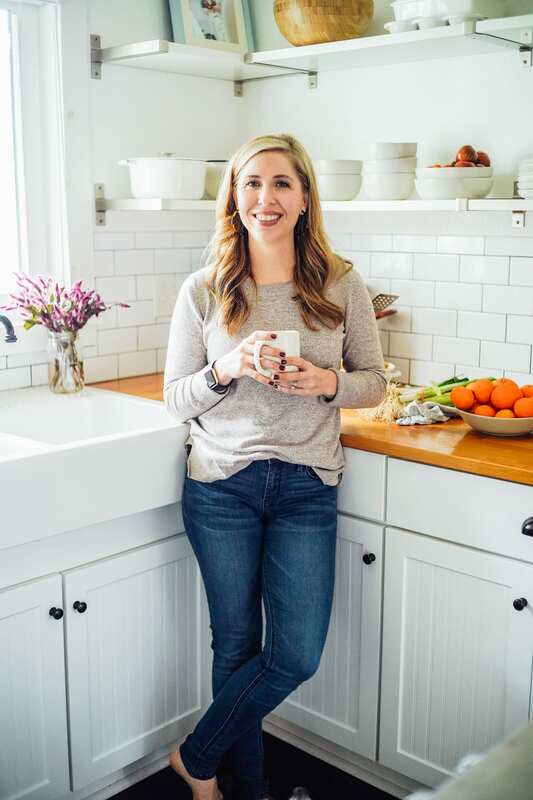 Thank you for sharing your recipes and life experience with us, love your blog! Hey Jan, Thank you so much! I’m so touched by your sweet comment, and I’m so glad you love the recipe and the blog :). These are fabulous! I need to make a triple batch next time. 🙂 Just a note, I used white wheat flour -no problems! Hey Lisa, I’m so glad you loved the muffins! Thank you for letting me know about the flour–I’m so glad it worked! I’ll make a note in the recipe :). I am passing along the compliment I received from my kids after baking these: “These are healthy?! They taste unhealthy.” Hahaha! I noticed you made sure to put that you used whole wheat…will they still turn out if I use white wheat or all purpose? Hey Laura, I believe white whole wheat will work 1:1, and possibly all-purpose flour. Whole wheat tends to be more dense, and that’s all I’ve experimented with in this recipe. Let me know how it goes! Tried this and made a double batch. Love it! I get what you mean by springy. Tastes wonderful warm. Thanks! This is a keeper. Hey Grace, Wonderful! I’m so glad you’re enjoying the muffins! Hi Kristin! I made these this morning, and we loved them! I can see where pre made baggies of dry ingredients would be an advantage in these! How does it look defrosting these? I’d love to take some to an upcoming brunch. Thanks! Hey Ticia, I’m so glad you enjoyed them! These defrost well-you can either reheat them directly from the freezer in the microwave for a few seconds (maybe a toaster oven would work, too), or defrost them in the fridge overnight and then serve them at room temperature. So good! I finally got a chance to make these and they’re amazing. The texture and taste are so satisfying. Anything that comes together with just one bowl to clean is a winner but these are over the top delicious. Yay, Katie! So glad you loved them!